Thanks again to everybody who took the time to fill out the survey. Here are the results (out of 42 responses). Although I threw out the idea of a separate blog for PLM 360, I have no immediate plans to create a new blog. That would require double the work, so I would need to find another blogger. I haven’t done a survey for a while. I want to make sure I'm providing the right content, and I’m also curious to know how things are going with the addition of PLM 360 content. So please take a moment to fill out some questions. Thanks. Update: The survey is closed. Thanks to all who participated. No surprises here. The app is a good concept, but just didn’t pan out. I like to write apps that fill functionality holes in Vault. But scripting isn’t something I can build-in with an app. Based on the results, the obvious conclusion is to kill it. The one person who said they used vLogic in production didn’t specify what it’s being used for. The source code is available for those who what to keep it alive. Thanks again to everyone who took the survey. vLogic: Keep it or Kill it? Update: The survey is closed. Thanks to everyone who participated. Here are the results. 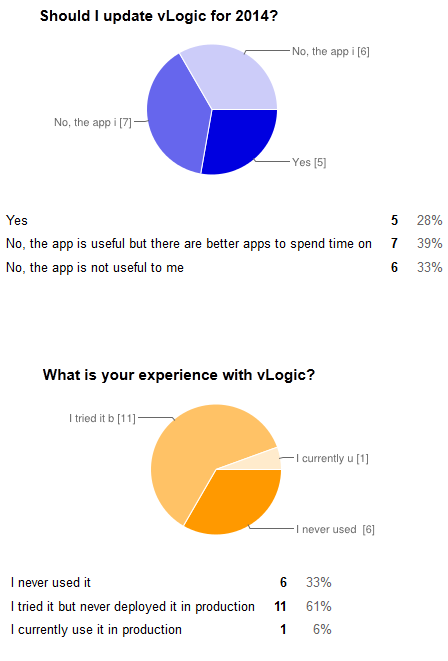 The vLogic app, my attempt at adding scripting to Vault, didn’t really turn out as I had hoped. The scripts are difficult to write and debug. I didn’t get much response on the app either. So I’m thinking of not updating it for 2014, but I thought I would give the community a chance to speak up. Thanks to everyone who took my survey. Here are the results if you are interested. My basic takeaway is that a long video with full content is better than a short video with less content. This means that there won’t be many changes to how I create my videos. I will still focus more on showing the content and less on the video length. Although there is room for improvement, my videos are providing useful information to the community. So it’s definitely worth the effort for me to keep making them. I’ll try to improve the videos as best I can, but I also have to be mindful of my time. I can’t spend all day making videos, so I have to do the best I can with the time that I can find. Recently my videos are turning out much longer than I intend them to be. For example, I intended only 10 minutes for DECO tips and tricks, but I wound up with a 25 minute video after editing. Maybe this is a problem I need to fix, or maybe it isn’t. Maybe things are perfect the way they are. To help me find an answer, please take this short survey. Thanks! Well, that didn’t work out very well. A couple of weeks ago I asked for people to submit useful Vault links. I got a total of two responses. As promised, I will be highlighting each of these links. I’ll also add some links of my own to round out the article. As the name implies, this German blog focuses mainly Inventor. However, there is a very good Vault section with some original content. For example, using Vault with Dropbox and instructions on using a script to show who is currently logged into Vault. There is also a good set of articles on Productstream Professional. A good blog that covers many Autodesk products including Vault and PLM 360. Most posts are quick tips, but there are also some good article-length postings. For example, using Vault and iLogic to override mass properties in iParts and using multiple Inventor libraries. I feature these guys a lot, and for good reason. Their blog has some excellent articles on Vault programming. Each one is filled with technial information and a generous helping of source code. I'm not going to highlight any individual articles because I literally can't decide wich ones to choose. All the articles are worth checking out. This site has the best Vault form that I have come across outside of Autodesk. I even post there from time to time. My only wish is that Google was better with German to English translations. They also have a very good Productstream Professional forum. I’m pretty sure this is the best Vault blog in Russian. There you will find interesting articles such as using Vault and Revit Server and a history of Vault. Although the main focus is Vault, there are a lot of PLM related articles popping up. I love hearing about all the technical Vault information that people create. It’s sort of a hobby of mine. There is some pretty good stuff out there. Such as how to set up Vault on a cloud server and a Russian class on Vault API programming. It’s all good. So I thought I would compile a list of these resources - these sacred tomes of technical Vault knowledge, gathered from the farthest reaches of the internet. If you have created or know about any of these resources, please tell me about them using this survey link. Feel to submit multiple times. It has to be Vault related and useful. It can’t be created by Autodesk. I’ll compile the results into an article later on this month. Thanks to everyone who took the time to take the survey. Here are the results. As expected, most people are in favor of open source. A lot of people said they would contribute, and the numbers are good when you total it up. As I stated before, Autodesk doesn’t have a good policy for this sort of thing, so nothing is certain. But, this survey gives me enough to put together a proposal. Thanks again. Would we be able to contribute our own apps/utilities ? Or will it be purely tools created by yourself ? [Doug] No. Since the Autodesk policy is vague, I’m going to stick to the safe answer. Maybe down the road, this can change. Of course, if you get stuck there are various ways you can get help, such as ADN or the Vault Customization discussion group. I have a lot of apps on this site. And several of them are quite good, if I do say so myself. But there is always room for improvement. I frequently get suggestions on how to make something better. If I had an infinite amount of time, I would implement all these suggestions. But I don’t have that kind of time. So improvements either have to be postponed indefinitely or somebody else has to write them. That brings me to the Open Source approach to software development. Technically, my apps are already open source because I post the source code. But when it comes to updates, there is no way for an outside party to contribute to the app. Things like SourceForge have been suggested to me in the past, and it’s a good suggestion. But a lot of details need to be worked out before I head down that path. The main problem is that, as far as I know, Autodesk doesn’t have a good policy for this sort of thing. I would need to work out the details with my bosses, product managers, legal department, etc. The whole thing could get shot down at any point. Of course, the whole effort would be for nothing I’m the only one contributing to it. There is not much incentive for somebody to contribute on a free app. It might be better to ignore open source and just focus on mechanisms that offer a monetary rewarded. For example, I know that some consulting companies are modifying my apps for specific customer contracts. I’m fine with that. I’m also fine with somebody taking my app, adding features to it, putting it up on the Vault app store, and charging for it. If you have an opinion, please fill out the survey below. I’d love to hear your thoughts.